Twinings Of London Tea wants to give you a chance to win the ultimate WALT DISNEY WORLD RESORT vacation with the perfect balance of theme park magic and adventure at sea in just one Disney vacation! 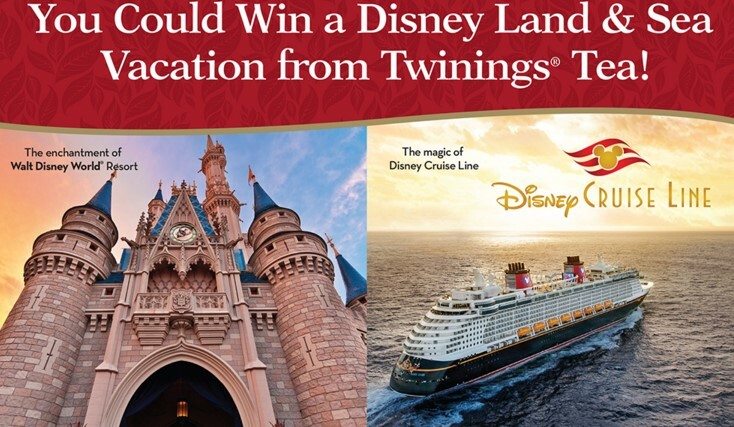 450 runner up winners will get Disney Gift Cards worth $50 each or awesome little tea chests from Twinings! One (1) Grand Prize Winner will receive a Disney Land and Sea Vacation for up to four (4) people as additionally detailed in Rule #5 below; Approximate Retail Value (“ARV”) of Grand Prize: $13,160. Two hundred fifty (250) First Prize Winners will each receive a $50 Disney Gift Card (subject to restrictions); ARV of First Prize: $50.00 each. Two hundred (200) Second Prize Winners will each receive a single slot Twinings Tea Chest; ARV of Second Prize: $15.00 each.